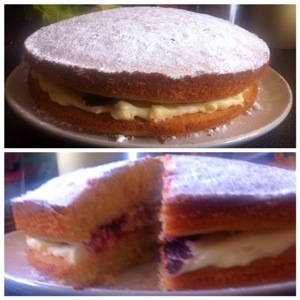 I thought I would try baking something I’ve yet to try…. As championed by everyone from Mary Berry to Delia Smith and every other chef worth their salt. (Even Nigella tweeted a pic of one the other day!!) Why, no doubt you are asking, have I never tried this before? After all this is one of the most well loved and basic of recipes. The answer is simple… As you know by now I’m new to this baking lark and admit I’ve never had 2 matching tins until we picked them up at a recent boot fair!! Several Internet searches later and it seems to boil down to the quantities being right in order to get the perfect Vicky Sarnie. Some schools suggest you stick rigorously to the 4 x 8 x 8 x 8 rule (that’s 4 eggs, then 8 oz. of flour, sugar & butter) which seems really straightforward but what seems to be getting the best results for others is weighing your whole eggs and then matching that quantity with the other ingredients. So this is what I’m trying. It turns out that it’s not just about quantity but its also all about the rise!! Baking powder seems to give you an extra boost when you really need it so I’m thinking that’s the way forward for me and of course I’m going for a head start by using self raising flour as well. But shirley it’s what’s inside that matters? Now as we talk about fillings and before you get all W.I. On me, I’m telling you now I’m not doing this to win GBBO I’m doing it as a treat for my colleagues so I need to make this cake go as far as I can. I’ve already got homemade blackcurrant jam and I’m going for buttercream Icing too as I think this will taste the nicest. Mary Berry can rest in her pumps. My first attempt is no show stopper but it did put a smile on the Dazzler’s face which means I now have to explain why there is a gaping wedge missing if it makes it to work!! It took longer to cook than my recipe stated but that’s because I had to keep rotating them and my oven isn’t the best on temperature!! Sprinkle the finished cake with a dusting of either icing or caster sugar Et voila! !